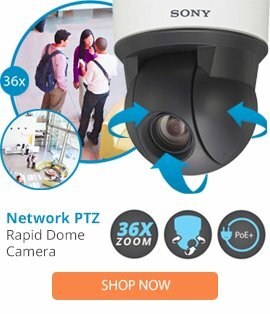 The DD423 from Pelco is a 23x spectra IV SL dome drive with ¼" EXview HAD image sensor delivers clear images at a resolution of 540TVL. The camera has a varifocal lens with a focal length of 3.6-82.8 mm at f/1.6 and offers a 23x optical zoom and 12x digital zoom. The on-screen compass, tilt, and zoom display feature helps in determining positions when required. Image quality is enhanced with features such as backlight compensation, white balance, and automatic gain control. With 64 presets, the camera offers ± 0.1° preset accuracy and is capable of continuous 360° rotation. The proportional pan/tilt feature decreases pan/tilt speeds in proportion to the depth of zoom, and the camera's variable scan speed ranges from 1-40°/sec. The DD423 camera also has a 'freeze frame between presets' feature that ensures a seamless frame transition between presets. Password-protection ensures that settings cannot be tampered by unauthorized persons. Zone Blanking will blank out an entire area or zone (which is set by a system operator) to eliminate any unnecessary video information from being processed, thus decreasing video traffic over a network. Up to 8 zones can be programmed to output blank video for areas not requiring video surveillance. The blank video output can be with or without labels; each label has a maximum limit of 20 characters. The Window Blanking function blocks up to 4 user-defined, 4-sided shapes from being viewed by the operator.